Did you see my Coffee Drop Cookies that I whipped up a few weeks ago? I am visiting that same vintage cookbook to bring another recipe back because, to me, it's classic flavors that are still "hip" today. I have sort of built up my pantry to include all the items that I might need to whip up something that I might fancy on any given day, so when I saw that I had ample sour cream left over from a Taco Night, I thought what better thing to do than make Old Fashioned Sour Cream Cookies! Sift flour with baking powder, baking soda and salt; set aside. In a separate large bowl, mix with a handheld, at medium speed, the butter, sugar and eggs until light and fluffy. 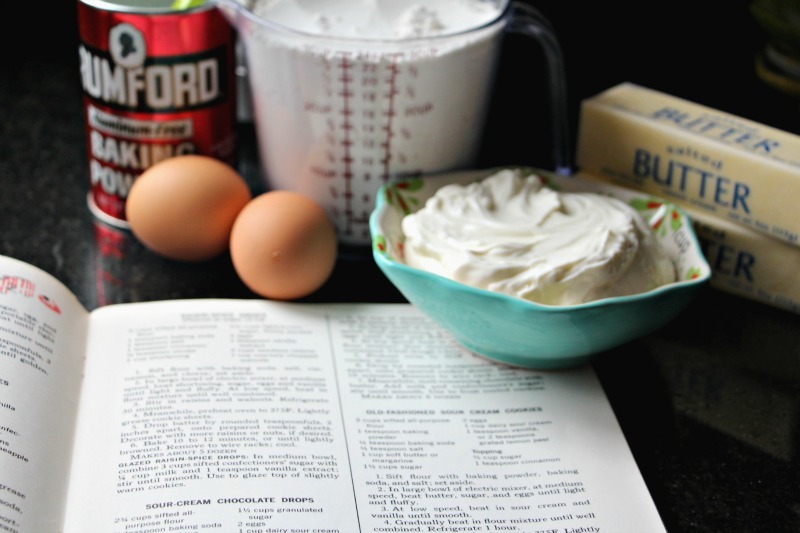 At low speed, beat in sour cream until light and fluffy (it's all about the L&F over here, folks!). Gradually beat in flour mixture until well combined. Refrigerate for 1 hour at least. Preheat the oven to 375 degrees. Lightly grease your cookie sheets. Drop batter by slightly rounded table-spoonfulls, 2 inches apart, onto the prepared cookie sheets. For the topping, sprinkle the cinnamon and sugar mixture onto the cookies before baking. Bake 10-12 minutes or until golden brown. Remove to a cooling rack before enjoying the yumminess! Truly, I wondered how these cookies would be but this recipe is absolutely, 100% delicious and super simple to make. Do you have a sour cream cookie recipe to share? I'd love to try another one to contract and compare cookies... Mmmmmm.